Project of Research for Offshore Seismics and geoElectrics :The project aims to assess the feasibility of geophysical approaches for imaging and monitoring marine geological media by means of seismic and DC-electrical methods adapted to the high spatial variability of the investigated media. The design of the wind-turbines foundations in near-offshore contexts requires the characterization of the physical parameters in sub-marine geological media, including the determination of their spatial and temporal variations. The propagation velocity of shear seismic waves is a crucial mechanical parameter for geotechnical issues. DC-Electrical resistivity is a complementary parameter that enables to discriminate between lithological layers. However, within the first 20 miles from the French Atlantic coast, the geological structures are too complex for the hypothesis of stratified medium to be considered valid. Consequently, seismic methods based on the analysis of the surface waves dispersion and the usual geo-electrical 2D-imaginig tools can not be used. To overcome this challenge the PROSE project aims to define the feasibility of seismic and DC-electrical resistivity methods able to take high spatial variations into account for imaging undersea geological media in the near-offshore area. 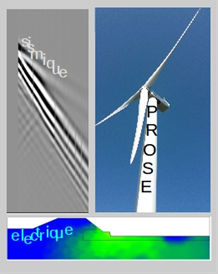 The PROSE project is also dedicated to the development of monitoring techniques for the subsoil media in the vicinity of the wind-turbines foundations, both during their installation and their service life since the temporal evolution of the surrounding sediments is currently essentially unknown and difficult to assess. Towards a better knowledge of near-offshore geological media and their spatial variability: analysis of the potential to acquire and process geophysical data : 1) concerning seismic data acquisition carried out at sea-bottom for quantifying S velocity down to 50 m deep in the aim to overcome the inversion of surface waves phase velocity dispersion ; 2) concerning geo-electrical data, by taking the undersea environment into account to overcome the loss in sensitivity to resistivity contrasts between saturated sediments. Towards the monitoring of undersea geological media around foundations in near-offshore context : analysis of the ability of seismic and electrical approaches to assess changes in terms of spatial and temporal resolution, and sensitivity during the installation as well as during the service life of a wind-turbine. Feasibility of geophysical methodologies in near-offshore for characterizing the mechanical and geo-electrical parameters of the subsoil including their spatial and temporal variations.